El Paso Father/Son Felipe Adel, Sr. & Jr. Ten new champions were crowned at the USTA Southwest Adult League Section Championships, held July 30-Aug. 1 in the Phoenix/Scottsdale area. Three sites - Phoenix Tennis Center, Indian School Park and Scottsdale Ranch Park - fielded the three days of play and hundreds of matches at the tournament, which was plagued by numerous rain delays each day. A special thanks goes out to the sites for allowing us the use of their facilities, our volunteers, league coordinators who came in to work the event, our USTA Southwest League sponsors All About Tennis and Head/Penn, our host hotel the amazing Hotel Valley Ho and the to the players themselves who made the trips from their various spots across the Section. Congratulations to our new champions, and good luck at Nationals! Click HERE for a list of 2010 National Championships League dates by division. 8 a.m. - After about a two-hour rain delay to start our Saturday play, matches are back on and play has resumed at all sites. Stay tuned to the web for more details and updates throughout the day. Play resumes for about four hours with several teams taking a stranglehold of their divisions and many divisions finishing play. But a rain delay hits about 2:30 p.m. which postpones play at Scottsdale Ranch Park (three matches remaining) and Phoenix Tennis Center (14 matches remaining), but all divisions did finish. In 2.5 Women - Surprise Court Queens and GEPTA Wildcard (EPTC) both finished the day with 2-0 records and will set up a winner take-all on Sunday for the title. In 3.0 Women - Southern Arizona women (Tucson Country Club) have a 2-0 record in their flight and a match win and two-court lead over second-place Central Arizona (Element of Surprise). In 3.5 Women - Central Arizona (Kinney) is in the lead with a 3-1 team record, but second place SAZ and GEPTA were still in contention to Sunday. In 4.0 Women - Northern Arizona at 4-0 has a two-match lead heading into the final day. 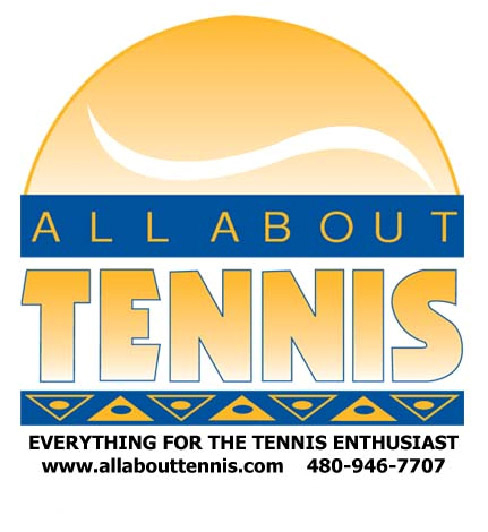 In 4.5 Women - Northern New Mexico (Jerry Cline Tennis Center) and Central Arizona (Ariz. Country Club) both were 2-0, setting up a final-day showdown for the division crown. In 3.0 Men - The Central Arizona (Volley Vultures) have a two-match lead on second-place GEPTA. In 3.5 Men - Northern New Mexico (High Point Sports & Wellness) had an unblemished 4-0 record after Saturday's play and will take the lead into the final day. In 4.0 Men - Central Arizona (Phoenix Tennis Center - Terao) had a spotless 4-0 record, but two GEPTA teams were chasing and still in consideration at 3-1. In 4.5 Men - Central Arizona (Flinn) won a showdown with Northern Arizona (Sedona) 4-1 to vault into first place with a perfect 4-0 record in the division. Men's 5.0 - Northern New Mexico (Shellaberger Tennis Center) had a perfect 3-0 record after three complete rounds of play. 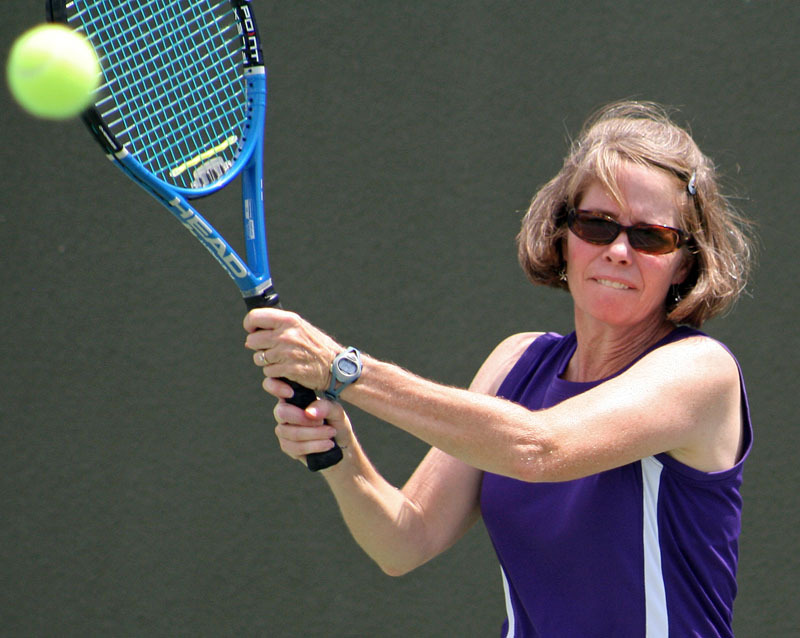 While it didn’t go off without a hitch, the first day of play at the 2010 USTA Southwest Adult League Championships did fall a little behind schedule. The early morning rain shower only briefly dampened players’ spirits, though it did manage to knock one site (Scottsdale Ranch Park) out of commission for about three hours before play resumed. The on-court action was as steamy as the sweltering, high humidity conditions in Phoenix, a rarity for the summertime. Several teams staked their claims to early top spots in their pool play, positioning themselves nicely for a potential Southwest Section League Championship title and an automatic championship berth. Play resumes Saturday and Sunday at 6 a.m. Results from the first day of play are below or by clicking the above links. Good luck to our teams in action tomorrow, and don’t forget the ‘I Love the 80s Player Party’ tomorrow night at the Hotel Valley Ho. Some teams will switch locations for Saturday, so please consult your captain's packet for the final schedule of times and sites. See you on the courts bright and early! Women’s 2.5 (At Phoenix Tennis Center)– The Surprise Court Queens jumped out to a first-day lead after winning a 3-0 decision over GEPTA El Paso Country Club. The ‘Queens’ dropped just 11 games in those three matches, and are a match ahead of the GEPTA Wildcard team from El Paso Tennis Club, which won their match 2-1 over the Northern New Mexico (Felice) squad. 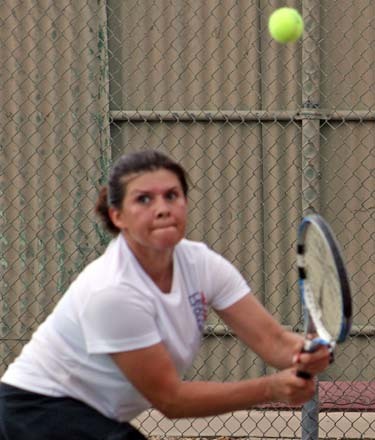 Women’s 3.0 (Indian School Park) – Northern New Mexico’s Jerry Cline Tennis Center team and Southern Arizona’s Tucson Country Club squad both were knotted after day one with 1-0 records. Both teams pulled out 3-2 victories, NNM’s over Central Arizona’s ‘Element of Surprise’, and SAZ over GEPTA’s El Paso Country Club. Women’s 3.5 (at Indian School Park) – Southern Arizona’s Tucson Racquet Club bunch led the division after day one with a 2-0 team record. The SAZ gals dropped Central Arizona (Phoenix Tennis Center – Kinney) by a 4-1 score in their opener, then followed it up with a 3-2 win over Northern New Mexico - Tanoan Country Club. Women’s 4.0 (at Scottsdale Ranch Park) - Central Arizona had a 2-0 record after day one to take an early lead in the flight. Women’s 4.5 (at Phoenix Tennis Center) – Northern New Mexico Jerry Cline Tennis Center and Central Arizona (Arizona Country Club) both grabbed the day one lead with opening match victories. NNM topped GEPTA (El Paso Tennis Club) by a 4-1 score, while Central Arizona downed Southern Arizona (Tucson Racquet Club) 3-2. Men’s 3.0 – In a two team division, Central Arizona’s Volley Vultures team (Phoenix Tennis Center) nudged ahead with a 3-2 win over GEPTA Tennis West. The teams will play each other the next two days. Men’s 3.5 – GEPTA Wildcard (Tennis West) and Northern New Mexico High Point each posted 2-0 division records on opening day. GEPTA posted back-to-back 4-1 wins over Southern New Mexico (Lions Park) and their city rival GEPTA El Paso Tennis Club team, while NNM High Point won 3-2 over Southern Arizona (Reffkin Tennis Center) to go along with a 4-1 win over Central Arizona (Dzielak). Men’s 4.0 (at Phoenix Tennis Center) – GEPTA Wildcard (El Paso Tennis Club #4) and Central Arizona (Phoenix Tennis Center – Terao) each went 2-0 in their opening matches of pool play to claim the first-day lead. GEPTA eked past Northern Arizona Lost Boyz 3-2 to start the day, then downed Southern Arizona (Hilton El Conquistador Country Club) 4-1. Central Arizona started with a 4-1 win over the SAZ squad then edged GEPTA (El Paso Tennis Club #1) 3-2. The two teams open with one another on Saturday at 6 a.m.
Men’s 4.5 (at Scottsdale Ranch Park)– Northern Arizona (Sedona) and Central Arizona were both 2-0 after Friday’s pool play, with both teams squeaking out their second matches by 3-2 scores with the aid of clinching victories at No. 2 doubles. Those teams will square off at 7:30 a.m. at the Phoenix Tennis Center. Men’s 5.0 (at Scottsdale Ranch Park) – Northern New Mexico’s Shellaberger Tennis Center (Santa Fe, N.M.) claimed victories over GEPTA El Paso Country Club and Southern Arizona (Sabino) on the first day, putting them squarely in the driver’s seat over the next two days. NNM topped SAZ 3-0 in their opening match, then captured a 2-1 decision over GEPTA. Each team in the 5.0 division will play each other twice.